Bedecked in her dress-up finery, our Victorian miss, Abigail, catches the bright beads of sparkling water in her opened apron accompanied by the lyrical sound of water music cascading into the bowl below. Abigail is tastefully hand painted in muted tones while the Baroque bowl and base are hand finished to replicate fine marble. 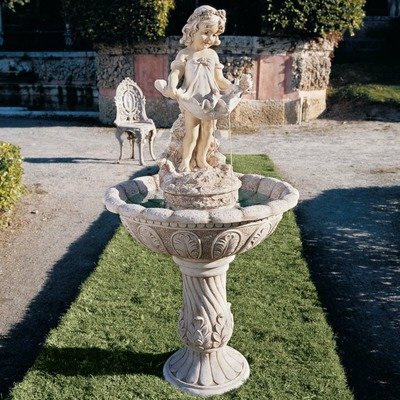 Cast in designer resin for easy assembly in home or garden, this splendid fountain features an integrated UL-listed indoor/outdoor pump. Ships in 5 pieces. 22andfrac12;”dia.x48andfrac12;”H. 36 lbs.